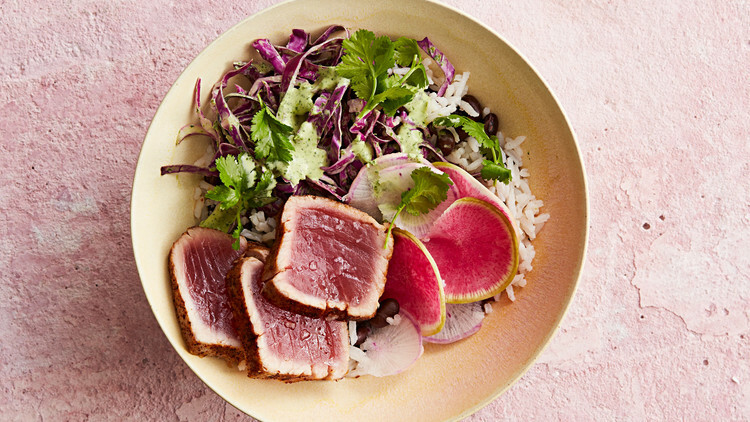 Composed of some wholesome ingredients such as rice, black beans, cabbage slaw and fresh tuna spiced with chilli powder, this power bowl makes a light yet satisfying dinner or lunch. A zesty cilantro cream dressing brings it all together. In a small saucepan, combine rice and 1 1/2 cups water. Season with kosher salt and pepper; drizzle with oil. Bring to a boil, then reduce heat to low; cook, covered, until water is absorbed, 12 to 15 minutes. Remove from heat; let stand, covered, 10 minutes. Stir in beans. In a food processor, puree cilantro, sour cream, lime juice, 2 tablespoons oil, and pinch of chilli powder. Season with kosher salt. Toss cabbage with 1/4 cup dressing; season with kosher salt and pepper. Heat a small skillet over high. Pat tuna dry; season with salt and remaining chilli powder. Swirl remaining oil in skillet; add tuna. Cook until golden brown on all sides, 1 to 2 minutes total. Let stand 5 minutes; slice thinly against the grain. Sprinkle with flaky salt. Serve with rice mixture, slaw, radishes, cilantro, lime wedges, and dressing.